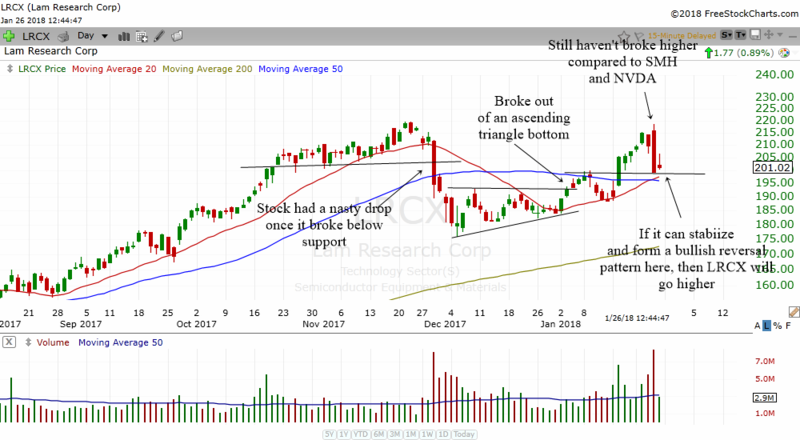 Just like NVDA, LRCX had a nasty correction but managed to form an ascending triangle to climb back higher. Here I will use technical analysis to see what LRCX might do next. If you look at the chart of most semiconductor stocks, you will probably see a very familiar pattern. Most of them will mimic the looks of the SMH which is the etf for the semiconductor sector. In the case of LRCX, it does follow the SMH but it lags a bit. The chart above is the daily chart of LRCX. Firstly, the stock had a nasty drop back in November 2017 after it broke below a support area. 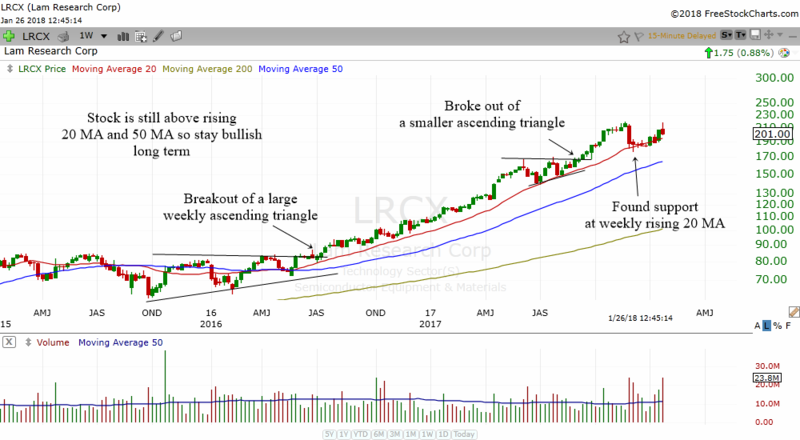 The drop was quite scary but LRCX immediately started to form an ascending triangle in the daily chart. The pattern acted as a bullish reversal pattern for LRCX. Once it broke above the pattern, the stock moved higher. However, it was unable to go above the old highs. This is a sign of less bullishness compared to other stocks such as TXN and NVDA. Right now, LRCX has dropped to an area of support. It is also very near the rising 50 MA. If LRCX can form some kind of bullish reversal pattern in the daily chart or even the 60 min chart, then the support will hold and it will help LRCX to go back up. It might even challenge the old high and make another all time high. The chart above is the daily chart of SMH. As you can see, SMH is much stronger than LRCX. Meaning, LRCX is lagging a bit behind the sector index. That is alright as long as it plays catch up as soon as possible. Some stocks will be leaders like NVDA, and some stocks will lag a bit. What you don't want to see is a stock that is 10 miles behind the entire sector. In the case of LRCX, this guy is still ok. He is just lagging 200 meters behind the SMH. The chart of SMH looks quite bullish at the moment. It also had a bullish cross recently. 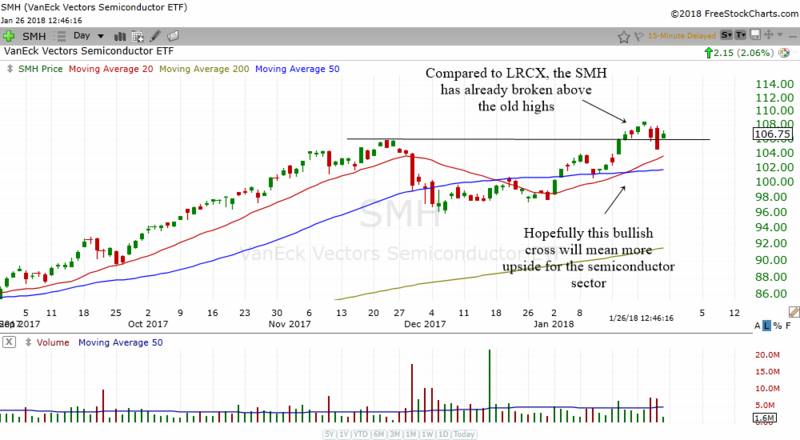 If SMH continues to do well, I believe that LRCX will also continue to do well. The 3rd chart I want to show you is the weekly chart of LRCX. If you had invested in this stock back in 2016, you would have made quite a big profit on this one. Not as big as NVDA but the returns are still impressive. There were 2 weekly ascending triangles in the chart as well. The correction in the daily chart was a small blip in the weekly chart. The stock found support at the rising weekly 20 MA. LRCX is still above its rising weekly 20 MA and 50 MA. This shows long term strength. As long as it stays above these MAs, the long term investor should continue to be bullish.